One of the main ingredients of this marvelous and ancient recipe is Amalaki. The fruit of the Amalaki tree contains high levels of Vitamin C and balances all three doshas. It includes five flavours (all except salty). In the classical Ayurvedic texts Amalaki is one of the most highly valued and important Rasayanas (life-elixirs) boasted by Ayurveda, with a rare combination of positive properties. In the authentic Ayurvedic writings Amalaki is even described as a ‘divine healing plant’. Our original Maharishi Ayurveda Chyavanprash includes many other valuable ingredients, for example ‘Dashmool’, whose exotic name indicates a valuable combination of ten Ayurvedic roots. Dashmool soothes all three doshas, but especially Vata. This exceptional recipe includes the famous Indian long pepper, ‘Pippali’, ‘Shatavari’, the wild Indian asparagus (whose consumption Ayurveda traditionally recommends especially for women), the delightful Vata-pacifying ‘Ashwagandha’ (Winter cherry, known as ‘Indian ginseng’) and a large number of other unique ingredients. 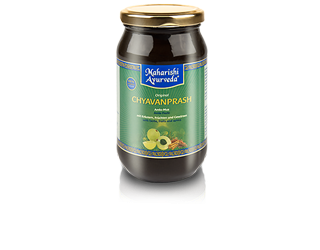 Enjoy 1 to 2 teaspoons of Maharishi Ayurveda Chyavanprash on its own, with warm milk or warm water in the morning or at any other time of the day. Delicious as a fruit jam. *Vitis vinifera (raisin), Inula racemosa, Pistacia integerrima, Habenaria intermedia, Microtylis wallichii, Tinospora cordifolia (guduchi), Phyllanthus niruri, Curcuma zedoaria, Nymphaea stellata (water-lilly), Fritillaria roylei, Adhatoda vasica, Martynia annua, Mesua ferrea, Polygonatum verticillatum, Teminalia chebula (haritaki), Pueraria tuberosa, Oroxylum indicum, Solanum xanthocarpum, Gmelina arborea, Teramnus labialis, Tribulus terrestris, Uraria picta, Elettaria cardamomum (cardamom), Clerodendron phlomidis, Sida cordifolia, Boerhaavia diffusa, Solanum indicum, Stereospermum suaveolens, Phaseolus trilobus, Leptadenia reticulata, Cyperus scariosus, Desmodium gangeticum, Santalum album (white sandalwood), Aegle marmelos.